"Sampath Speaking" - the thoughts of an Insurer from Thiruvallikkeni: monsoon coming, is Chennai ready ? : Anakaputhur .. SYMA relief work ..
monsoon coming, is Chennai ready ? : Anakaputhur .. SYMA relief work ..
Anakaputhur is a suburb of Chennai ~ nearer Pallavaram, Thiruneermalai. The Maduravoyal by-pass runs over it. Anakaputhur lies a little beyond the international airport on the banks of the Adyar river, that originates near Manimangalam village by Chembarambakkam lake and weaves through three districts—Kancheepuram, Tiruvallur and Chennai—before culminating the nearly 43km long journey into the Bay of Bengal. Like the Cooum river, the Adyar flows through Chennai, carrying away the sewage and effluence that the city spews into it. Anakaputhur was once famous for its traditional weaving business, which has declined due to modern competition. In Aug 2015, at the Centenary Auditorium of the University of Madras, Prime Minister Shri Narendra Modiji attended the first National Handloom Day celebrations and unveiled a logo for the handloom sector. The significance of the date, as mentioned in his speech on the occasion, was the launch of the Swadeshi movement on this day in 1905 as a call for boycott of imported textiles. Among the tributes presented to the prime minister on this occasion was a shawl woven using 25 types of natural fibre, including one from the banana stem, made by the Anakaputhur Jute Weavers Association (AJWA). Livemint on that occasion reported that Anakaputhur was once a weavers’ village, one of many that produced plaid-inspired checked fabric, mainly for export. The Real Madras Handkerchief that was woven here has a history with close links to the slave trade. As a drape, it was popular in Africa, especially Nigeria, but since the coup in 1966 and the subsequent civil war, the demand for Madras Handkerchiefs also came down. Madras checks, sometimes simply known as “Madras”, became popular in the US. Now in Anakaputhur, the difference is stark. 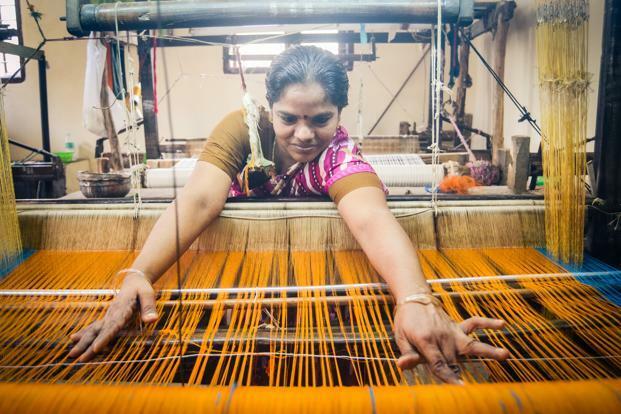 C. Sekar, a third-generation weaver who heads the AJWA, says that while there were 5,000-odd handlooms 25 years ago, there are only about 350 today. About 70% of the weavers make lungi fabric; the rest are weavers of silk-cotton sarees and those, like Sekar, who weave using natural fibre. Sekar is famous in these parts and brings together about 12 women’s self-help groups under the banner of the AJWA to extract banana stem fibre, turn it into yarn and weave yardage and sarees. At Sekar’s home in Anakaputhur, every inch of floor space in what would otherwise be a living room has been taken up by four pit looms, their teeming heddles and a spinning wheel fashioned from a bicycle wheel frame on which Sekar’s wife spins the yarn onto a bobbin. There is barely enough space for a single person to pass between the clacking looms, so we sit outside, on the thinnai or verandah reserved for visitors. Sunday 4th Sept, the Hindu carried an article titled ‘With monsoon not far away, is Chennai ready ? ~ the residents of the city are unlikely to forget the first few days of December 2015. 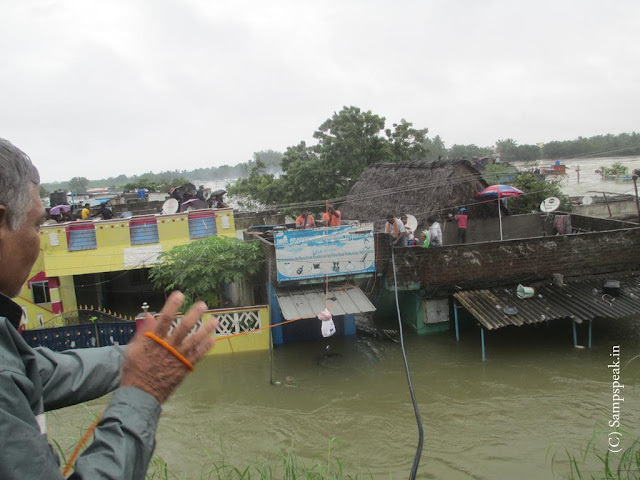 What started with overcast skies and rains, on December 1, turned out to be a nightmare, and heralded the floods that were arguably one of the worst in living memory. 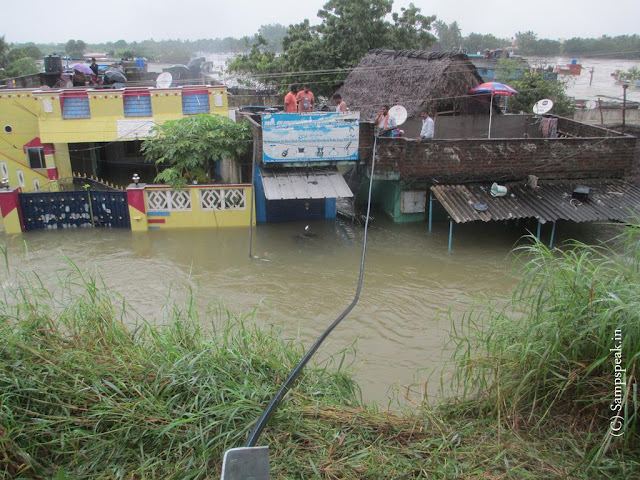 The rains, which lashed through the day, left in their wake a battered city with several areas that went under. Several lives were lost, thousands were displaced, stranded and had to be evacuated with boats and choppers, the loss of property ran to many crores of rupees, and normalcy was not restored until weeks later in many parts of the city. 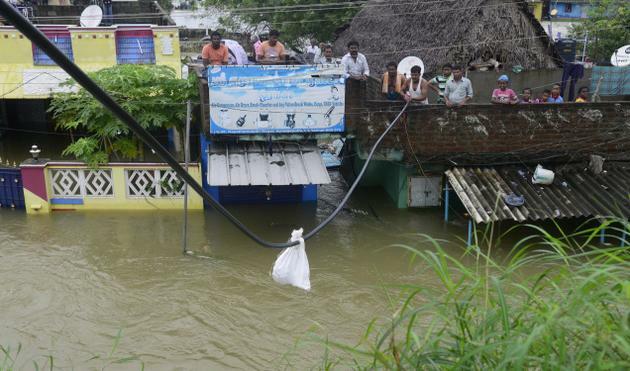 The release of water from the Chembarambakkam reservoir, as well as what the government called “unprecedented rainfall not seen in a 100 years” completed the destruction. 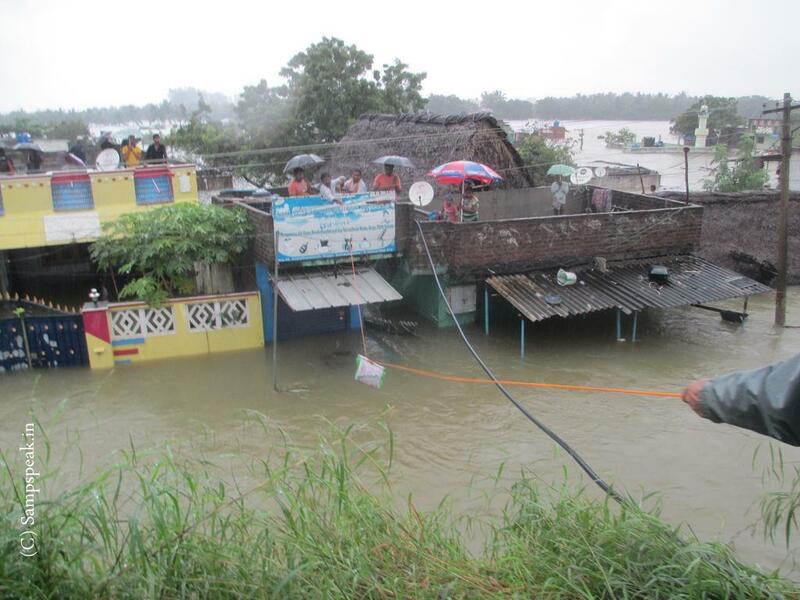 Nine months later, while many still remember the heroic rescue efforts which were mounted to bring the city back on its feet, the question on everyone’s mind is whether the city is prepared to face the northeast monsoon this year. Given how even a few hours of rain over the past few days (spilling over from the southwest monsoon) have caused substantial flooding, any consideration of the monsoon months in Chennai only brings a sinking feeling. Over the last two weeks, the city has come alive on social media, raucously wondering how the spell of rain that the city has received has crippled it what it bodes for the coming months. Of the 5 photos that the article had, this one drew my attention – have seen this in person .. and here is one from my post in Dec 2015, about SYMA’s role in Chennai floods. Rain has been unrelenting ~ there was so much of it on 23rd – and yesterday too [1st Dec 2015 ] there was heavy rain – it rained continuously. Record-shattering torrential rains brought Chennai to its knees on Wednesday as widespread flooding shut down the airport and factories of top automobile companies, while trains packed with passengers were rendered immobile on submerged tracks. Today, the rain relented a little by afternoon but a drizzle under overcast skies continued amid reports of rising water level in many parts of the state capital as well as its adjoining districts. The city remained off limits as cars, trucks and buses could not enter or go out of it. Several feet of water blocked most of its main roads and dangerous sink holes appeared on many streets. Some reports put that more than a lakh of people have been driven away from their homes as a 100 year old record of one day’s rainfall covering a month’s average, was virtually broken. Triplicane, fortunately is not affected. Today Thiruvallikkeni buzzed with activity. Srinivas Youngmens Association [SYMA] organised relief work. We organised sets of raincoats for Corporation workers [must place on record the great work they are doing in many parts of the city]. We arranged a mini-truck, carried relief material including mats, new blankets, new sarees, rice bags and food packets. Friends of Thennacharya Sri Padham Thangi Sabha also distributed food packets at many places. They joined with SYMA and handed over 200 food packets. We planned to handover the materials to Seva Barathi at Tambaram and travelled via Poonamallee High Road, Maduravoyal bridge. There was water, water and more …. On way saw river in spates and water flowing on roads in some places. Could not move beyond Thiruneermalai and were forced to return back – distributing food on the way. At Anakaputhur, it was a pathetic sight – people at housetops – water running like a small river – marooned, we could not move them out – but provided them food, blanket, mats – passing them through rope. We finally distributed the relief material at Maduravoyil Govt High School and returned home. Hi, Thanks i like your blog very much , i come back most days to find new posts like this!Good effort.I learnt it.